Vegans have the right to eat too! Ok, ok. I know what you are thinking. I’m a relentless petition signer, and i’m a serial petition writer. I’m overly optimistic, delusional, crazy even, to believe that online signatures could help change the world (in fact they do, too!) I decry the fact that I’m practically a nomad, a rootless environmentalist who couldn’t last more than five years in a place since I had the right to choose where to live. I would love to do grassroots action, and I envy a lot of my fellow greenies who get to build work in their communities. I have also done a lot of initiatives wherever I was in my home country. But I get disappointed when I had to uproot myself again and move. It is disconcerting to say the least when you have to uproot yourself every so often. I am more aware of it now that I am a development worker abroad. But then I also feel that as an environmentalist, I am a citizen of the world, and that I could work for change wherever I am. I also feel that communication is my gift. As a former teacher, writer, campaigner, and development professional, I see myself as a communicator. And as a communicator who considers Mother Earth as my home country, the internet is one of my strongest tools. So I really don’t mind even if people call me a slacktivist, I consider it a prestigious accolade because I do what I can when I can. I care. And believe me when I say that I am ‘truly engaged or devoted to making a change‘. I believe in whatever I do, I am only planting seeds, and that it doesn’t matter how big or small an act is, as long as the good intention is there. So yes, I made my second Bataris Petition. I’ve been chosing Bataris over Avaaz or change.org because I would like to bring the issue closer to the people I would like to join me. 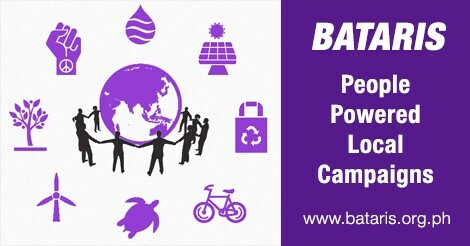 It is also a form of support to the small but growing Bataris community of change-makers in the Philippines. So what is this petition about? As this blog post says: Vegans have the right to eat too! Here is the full text of the petition which you can find at this link. We have a Right to Compassionate Food, Give us Access to it! Make compassionate (vegan) food available to all. Access to it should be a right. All establishments serving food and selling food products should make compassionate food choices available to all. There is a growing number of people all over the world, and even in the Philippines who are shifting to vegan diet and lifestyle. It is a conscious choice to show compassion for animals and Mother Earth, and to care for one’s own health and well-being. People like these should not be marginalized by having practically nothing to choose from in school, office, and hospital canteens, restaurants, hotels, and other food establishments. Manila Vegans, a facebook group that have grown a few hundred to 13,400+ in a matter of months, is proof that there is a growing interest in vegan diet. Aside from Manila Vegans, there are other vegan groups with thousands of members who are vegans, transitioning, or vegan-curious. 1. Compassionate/Vegan food is an ethical choice as it does not use any animal ingredients that cause needless suffering and death to animals. See the documentary Earthlings for more information. 2. Vegan food is better for the climate. With worsening climate change, shifting to vegan food drastically reduces ones carbon footprint. Meat-based diet has been found to generate more carbon pollution than the entire transport sector. An Oxford University study found that meat-based diets result to 7.2 kg carbon emissions a day, while only 2.9 kg for vegan diet. Also see the documentary Cowspiracy for better understanding of this. 3. Vegan food is kinder to Mother Earth. With the antibiotic-laden animal waste being generated by the poultry and livestock industry, so much soil and water are being polluted every single day. Livestock are fed with corn, soybeans and grains, which require huge amount of fertilizers and pesticides. 4. Vegan food is healthier. Whole foods, fresh fruits and vegetables are more alkaline and thus prevent many types of illnesses. Studies have shown that blood from vegans fight off cancer cells. There are also numerous studies showing vegans had lower risk of cancer, as well as lower rates of diet-related diseases such as obesity, diabetes, and hypertension. See the documentary What the Health. People who make an effort to make conscious choices for animals, for their health, and for the planet should be provided access to these kinds of food. It is totally unfair that people whose food choices hurt animals, themselves, and the planet should have so many food choices yet vegans often go hungry when eating out due to lack of choices. By providing compassionate food choices, it could also make businesses thrive. Owners of vegan restaurants and shops claim most of their customers are not even vegan but vegan-curious, who are more than happy to try healthier, more earth-friendly, compassionate food choices. This means that given alternatives, more people would start to choose vegan food. Even meat eaters deserve to have a choice when they want to try vegan alternatives. Vegans would like to alleviate the needless suffering and death of animals and in the process also protect the earth, the climate, and themselves. Why should hotels, restaurants, canteens, and grocers not provide vegan choices to them? This will be delivered to the Philippine Senate and The Philippine Congress, The Department of Health, Department of Trade and Industry, and Department of Education. It could also be delivered by any individual or group to restaurants, hotels, schools, hospitals, that do not serve vegan food. Initially, I thought of looking for a legislator who will champion the cause and file the bill I would draft. But since I am currently based in Cambodia, I know it’s nearly impossible for me to lead a policy advocacy initiative. I do hope that this petition inspires somebody to take up that task and I will do what I could in my power to help make it a success. I feel that by doing this petition, planting seeds in the minds of people regarding what we have a right to, what we deserve, is a good start. Somebody still has to talk to the Senate and Congress, and I will keep on looking for that person and I will still write the draft bill. I will explore all avenues to advance the right to access compassionate food. I’m also looking forward to individuals and groups using this petition to pressure establishments in their communities to provide vegan options to all. This is just the beginning. I couldn’t wait anymore. This is also rapid prototyping, because the longer I wait, the more I wouldn’t be able to do anything. Does this petition in any way resonate with you? Then please do sign and share it. You don’t even have to be vegan to support this initiative. All you have to do is care. Here is the link, sign and share away. Tags: action, Bataris, communicator, community, devoted, engaged, environmentalist, grassroots, initiatives, internet, nomad, optimisitic, petition, planting seeds, right, share, sign, support, vegan, vegan-curious | Permalink.